The leap from Wimbledon to Newport, R.I. is not as far you would think. Newport, like the village of Wimbledon, is well established. It was founded in 1639; the port community is steeped in tradition, yet evinces a quaint atmosphere loved by its residents and thousands of tourists that invade over the summer months. It boasts the highest number of ‘surviving colonial buildings’ in the United States — including the opulent Newport mansions, which were home to the wealthy during America’s Gilded Age of the late 19th century. The obvious connection Newport has with Wimbledon, at least this week, is tennis. The Tennis Hall of Fame tournament is the only ATP event played on grass in the United States, and it always follows the two weeks of hoopla that engrosses Wimbledon village and the most coveted of Grand Slams. 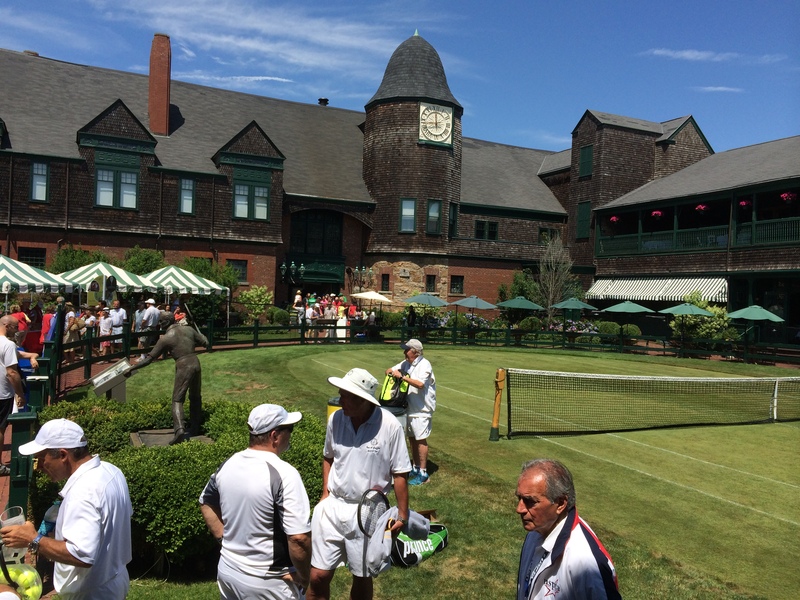 Although the Hall of Fame tournament is small — an ATP 250 event — the honor it bestows brings with it a sense of a continuing tradition perhaps only experienced when players compete on grass. This year’s lineup seems like old home week for Americans and Australians — although Lleyton Hewitt, the defending champion on his farewell tour, is not here. Davis Cup, scheduled for the weekend, has always been a priority for the Aussie and even more so as he approaches retirement. Last year, he intimated he would retire when Australia’s Davis Cup team was robust, which it is leading into the quarterfinals. Picked to play are Hewitt, Nick Kyrgios, Sam Groth, and Thanasi Kokkinakis. Ten of the 32 main draw entrants in Newport are American, led by two-time Newport champion John Isner as the No. 1 seed. Naturally, because the draw is small, American played American in the first round. Rhode Island’s own Jared Donaldson eliminated Austin Krajicek, 6-7(5), 6-3, 6-2, yesterday. Today, Rajeev Ram faced Isner, and it didn’t turn out well for the top seed. He was upset by the 2009 Newport champion, 6-7(5), 6-3, 7-6(8) and Ram saved one match point to record his third top-20 win. The American had defeated Kei Nishikori here in 2012, as well. The tournament was later spared the loss of another top seed and American, Sam Querrey (No. 6), who struggled against Matthew Ebden before pulling out a straight set victory, 7-6(3), 7-6(1). Too bad Querrey wasn’t on court to witness Isner’s match — perhaps the camaraderie would have helped. A total of nine Australians competing in qualifications and the main draw, are on hand, too. Returning to Newport, after nine years off tour, is Mark Philippoussis. He was granted a wild card into qualifications, almost a decade after the 38-year-old had won the title in 2006. Yesterday, he lost his opening, and only, match to American Eric Quigley in — as would be expected from the 6-foot-5 Aussie — two tiebreak sets: 7-6(1), 7-6(4). Philippoussis is also entered in doubles alongside Ryan Harrison. The American saw his charge at the title end in the opening round today, 6-1, 5-7, 6-3, to Yuichi Sugita. Stepping outside the boundaries of American and Australian tennis — two of the largest contributors of tennis stars over the decades — stood a man who has become increasingly more recognizable since Wimbledon: Dustin Brown. Although he hasn’t played Newport in a number of years, the German was happy to be back and win today. Their first set took close to an hour, but Brown closed the match against Adrien Bossel 20 minutes later, 7-6(4), 6-3. Next up for Brown is Querrey. The German defeated the American in Newport in 2010 in the same round. Does Newport provide a good backdrop for Brown after his headlining upset of Rafael Nadal at Wimbledon? Thank you, Dan!! Wonderful event.